One of the fastest-growing areas of the first Coast is the northern section of St. Johns County. Julington Creek Plantation, a Development of Regional Impact, was just the beginning more than 15 years ago. Since then, The area from Race Track Road through the Switzerland community down to County Road 210 has become a mecca for an array of new home choices. One of the magnets for growth is the World Golf Village area, which is headquarters for the World Golf Hall of Fame and an IMAX Theater. Golf abounds along the 210 corridor from the Club at South Hampton to golf courses designed by local favorite Mark McCumber to courses designed by golf legends Arnold Palmer and Jack Nicklaus who teamed up to develop the aptly-named King & Bear course. 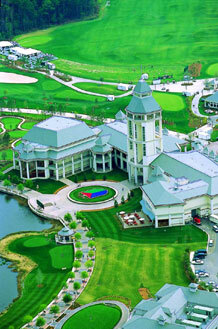 The World Golf Village offers a diverse array of housing options, including The Legends condominium homes. Handsomely designed in a style reflecting the relaxed Florida lifestyle, The Legends of Saint Johns offers a private fitness center, pool, putting green and tennis courts.